It was in the 1980s when Mr. Eyad Samhan left his job as a town planning officer to pursue his love for nature. He became a Wildlife Conservation Officer with the Brunei Museums Department, where he taught himself to become a researcher in the sciences. He started his work on biodiversity by conducting scientific research in all seven forest types in Brunei Darussalam. With the Royal Brunei Arm Forces (RBAF) providing helicopter services, Mr. Samhan and his research team was able to access isolated places in the wilderness. This journey led to new species discovery and records for Brunei Darussalam including Betta macrostoma, a species of fish which forms part of The IUCN Red List of Brunei and is endemic to Borneo. He also discovered a total of 30 species of pitcher plants (Nepenthes species) for Brunei including the discovery of Rafflesia priceii – a new record for Brunei. He also discovered the Rhizanthes lowii in Temburong District. In an effort to discover more species, he led expeditions to Tasek Merimbun, Kuala Belalong, Sg Ingei, and Belait Peatswamp. As a field supervisor of Tasek Merimbun in 1983 and 1984, he led a research team that caught a rare species of fruit bat, Megaerops wetmorei, which is endemic to Borneo and southern Philippines. This new significant discovery led to the nomination of Tasek Merimbun as one of only 11 ASEAN Heritage Parks and Reserves in 1984. The ASEAN Heritage Parks are educational and inspirational sites of high conservation values, preserving a complete spectrum of representative ecosystems of the ASEAN Member States. These parks embody the aspirations of the people of the ASEAN nations to conserve their natural treasures. Following this feat, he was then promoted to become the Curator of Natural History and the Manager of Tasek Merimbun Heritage Park. As the curator of Natural History and manager of ASEAN’s Tasek Merimbun Heritage Park between 2001 and 2009, he decided to zone the park into three categories which allowed the general public, scientists, and local communities to appreciate, participate, and promote their traditional lifestyle. In the early 1990s, the Royal Geographical Society of London and Universiti Brunei Darussalam launched the 14-month joint expedition to the Kuala Belalong lowland Mixed-Dipterocarp Rainforest. The rainforest ecosystem is home to some of the most diverse and species-rich forests on earth. Mr, Samhan was seconded from the Brunei Museums Department to Universiti Brunei Darussalam to head the expedition that involved about 74 scientists and live in the wilderness. He lived and worked there for five years in isolation, devoting his time to the research and conservation management of the rainforest ecosystem. This was where he discovered Rhizanthes lowii, a first record for Brunei Darussalam. By 2012-2014, he took another challenge at the Heart of Borneo Initiative where headed the first and most daring camera-traps project in the wilderness of Sungai Ingei in the upper source of Beliat River. Although poachers hacked many of their camera traps, Mr. Samhan and his team managed to capture rare beautiful images of Catopuma badia in four different locations. This was the first-ever record for Brunei of all five species of wildcats in Borneo (now confirmed existing in the wilderness of Brunei Darussalam). It was here that he again encountered the critically endangered Betta macrostoma. By issuing a decree, His Majesty the Sultan of Brunei has banned the species from export. The Heart of Borneo Initiative project in Sungai Ingei also led to the discovery of the Licuala, a species endemic to that area. 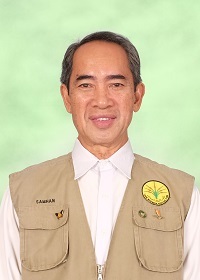 From 2012 to 2014, Mr. Samhan was involved in the survey on fauna and flora of the unique Belait peatswamp, the largest in tact peatswamp forest ecosystem in Borneo dominated by the Shorea albida. His findings contributed significantly to the preparation of the Belai Peatswamp Biodiversity Action Plan (BAP). To share his discoveries with the public, he served as a regional documentary presenter for several television stations. Now retired from the government, Mr. Samhan works as a freelancer on Ecosystem Services and as a volunteer assisting the Village Legislative Council (Majlis Perundingan Kampung) Bukit Udal, Tutong by managing ecotourism activities at Homestay Alai Gayoh Anak Pulau (HAGAP). The program was established in 2001 in conjunction with Brunei Visit Year. Mr. Samhan helped produce the Local Management Plan of the conservation area on community-based tourism activities with the theme: “Protection, Conservation of Biodiversity and Ecosystem Services and Cultures.” The program has created awareness and appreciation of Mother Nature. Among activities he conducts with HAGAP are interpretation forest walk, birds watching, spotlighting on mammals, reptiles and amphibians, watching of Bornean Gibbons, and Basic Identification of Tropical Rainforest Plants. The target audience of the activities are students and other interested groups. HAGAP had already attracted tourists from about 35 countries. In 2010, HAGAP received the “Excellent Village Award” that deserved a visit from a Royal Prince – Yang Teramat Mulia Paduka Seri Duli Pengiran Muda Haji ‘Abdul ‘Azim Ibni Kebawah Duli Yang Maha Mulia Paduka Seri Baginda Sultan Haji Hassanal Bolkiah Mu’Izzaddin Waddaulah.